[150 Pages Report] The pressure vessel market is expected to reach USD 184.87 Billion by 2021, at a CAGR of 5.38% from 2016 to 2021. Pressure vessels are helping industries in storing high pressure gases/liquids and find application in various industries such as oil refineries, chemicals, and power sector. The pressure vessel market has been segmented on the basis of end-user industry, type, material, and region. In the pressure vessel market, by material, the steel alloys segment is expected to lead during the forecast period. Increasing demand for electricity and growing investments in the power sector are likely to drive the demand for pressure vessels. 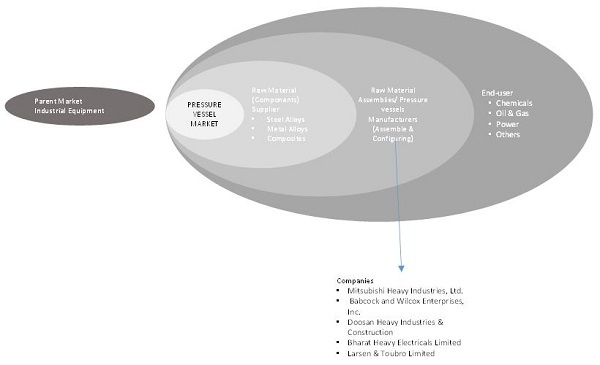 The pressure vessel market valuation for various segments has been arrived at by using pressure vessel implementations in various regions and planned investments of operators. Finally, the market size has been arrived at by consolidating markets for individual regions. Industry experts have also been contacted for validating the key findings of the report, in order to estimate the market size appropriately. Individual responses and viewpoints have been carefully studied and incorporated in the report. The market size has also been validated by both the top-down and bottom-up estimation approaches. In the top-down approach, regional and segmental markets have been derived from the parent market, considering the share of the segments. On the other hand, in the bottom-up approach, individual segment/regional market has been added to arrive at the final parent market. The pressure vessel market starts with raw material suppliers, which include steel, other alloys, composite materials, and welding equipment. In the later stage, suppliers of pressure vessels use these raw materials to fabricate the pressure vessels. Fabricated vessels are then offered to different industries such as oil & gas, power generation, chemicals, mining, and water & wastewater sectors. The report segments the market on the basis of end-user industry, type, material, and region. The pressure vessel market is expected to reach USD 184.87 Billion by 2021, at a CAGR of 5.38% from 2016 to 2021. The growth of this market is attributed to huge electricity demand and industrialization in different regions. Investments for renewable power generation in Asia-Pacific and North American countries have been planned to meet the rising power demand, which in turn are going to boost the demand for pressure vessels. Among various end-user industries for which pressure vessels are employed, the chemicals segment is expected to be the largest market by 2021. Asia-Pacific and North America comprise fast growing markets for this segment. Boilers are the largest segment among the type of pressure vessels. The boilers segment within the pressure vessel market is expected to have the highest growth from 2016 to 2021, given its increasing usage in the power generation sector. This market is expected to witness the maximum growth in the Asia-Pacific region. 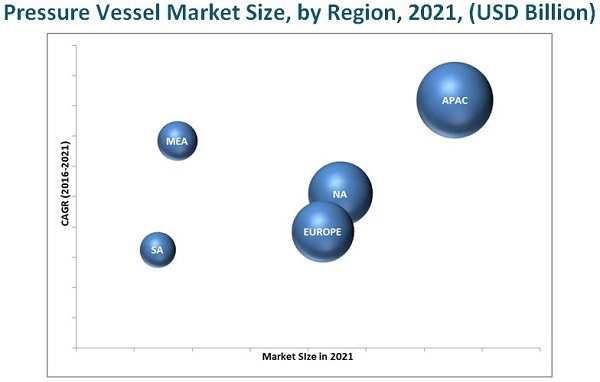 Meanwhile, Asia-Pacific is expected to be the largest market for pressure vessel during the forecast period. With electricity demand going up in the region, substantial investments in the power sector have been made, which are expected to boost the demand for pressure vessels. The region has some key companies including Doosan Heavy Industries & Construction (South Korea), Bharat Heavy Electricals Limited (India), and Larsen & Toubro Limited (India) operating in this market. At present, pressure vessel has high acceptance due to its unique properties and for being a highly customized product. However, factors such as mining industry slowdown and declining upstream oil & gas industry are restraining the growth of this market. There has been a stagnant growth in the global upstream oil & gas industry, resulting in countries shifting their focus and investments in other industries to diversify revenue stream. The slowdown in the mining as well as upstream oil & gas industries is expected to have a negative impact on the pressure vessel market. Mitsubishi Heavy Industries, Ltd. (Japan), the leading company in the pressure vessel market, focuses on improving its competitive strength through continuous and considerably high R&D investment in developing its products as well as technologies in the energy and other core business segments. It also emphasizes on strategic joint ventures and partnerships for better and technologically advanced product line. 12.2 Babcock and Wilcox Enterprises, Inc.
12.4 Mitsubishi Heavy Industries, Ltd.
12.7 Dongfang Electric Machinery Co., Ltd.
12.13 Westinghouse Electric Company LLC.